How do you age wine? This question might conjure up the image of a vast underground cellar, filled with antique barrels and dust-covered bottles. Of course, you don't need your own cave to cellar wine effectively. If you don't have a space that offers these conditions, you may want to consider purchasing a refrigerated wine cabinet to store your wine. Please note that there are important differences between wine coolers and refrigerated wine cabinets. Most importantly, coolers manage temperature only, whereas cabinets manage all the conditions listed below for proper long-term storage. Chemical reactions don't just happen in laboratories; they should be quietly happening inside your wine bottles, if all goes well. A fine wine's flavor matures thanks to these long-term reactions. Over time the tannins (the compounds that give wine a dry or astringent taste and feel) interact with other compounds and can turn into the sediment that collects in the bottom of the bottle. Although the aging process affects wine in many different ways, it should enhance the wine's complexity and reduce the strong, simple grape taste that wine often has when freshly bottled. This biochemical development is what wine-lovers mean when they talk about a vintage that "improves with age." However, the wine aging process can occur as intended only when you keep your collection at an optimal temperature with minimal fluctuations. The recommended temperature range for aging wines lies between 55°F and 60°F. Any temperature changes should be gradual. Rapid, drastic fluctuations in temperature can disrupt the wine aging process and damage a wine's flavor. Though harder to control than temperature, humidity (the percentage of moisture in the air) plays a vital role in letting your wines age gracefully. Less-than-ideal humidity conditions can have a disastrous effect on wine, even when kept at the right temperature. When humidity levels are too low, corks will dry out and shrink. Once a cork dries out and becomes brittle, air will leak into the bottle and oxidize the wine, spoiling its taste and bouquet. The wine may also leak out of the bottle, increasing the ullage (the air between the liquid line of a wine and the bottom of the cork), a sure sign of improper storage conditions. Insufficient humidity not only from the outside of the bottle, but also from the inside can cause corks to become brittle. The need to maintain a proper internal humidity is the reason why bottles always should be stored on their sides: the wine stays in contact with the cork, keeping it moist. When conditions are too humid—above 70% humidity—mold might start growing and risk turning your wine cabinet or cellar into a very large, unintentional terrarium. There's a good reason why wine cellars are dark: sunlight poses a threat to your wine collection. Ultraviolet (UV) rays penetrate wine bottles. Just as direct sunlight can negatively affect your skin, it can irreparably damage fine wines. If you leave fresh fruit in the sun for too long, it turns brown and spoils. Don't let UV rays similarly impact the taste of your wines. Wine breathes, literally, through the cork. This limited airflow contributes to the gradual chemical reactions occurring inside the bottle. For this reason, wine cellars and the space around wine cabinets should have clean air, free of strong smells. When the air isn't clean and fresh, odors could seep through the cork into the bottle and ruin the flavor and bouquet of your wine. 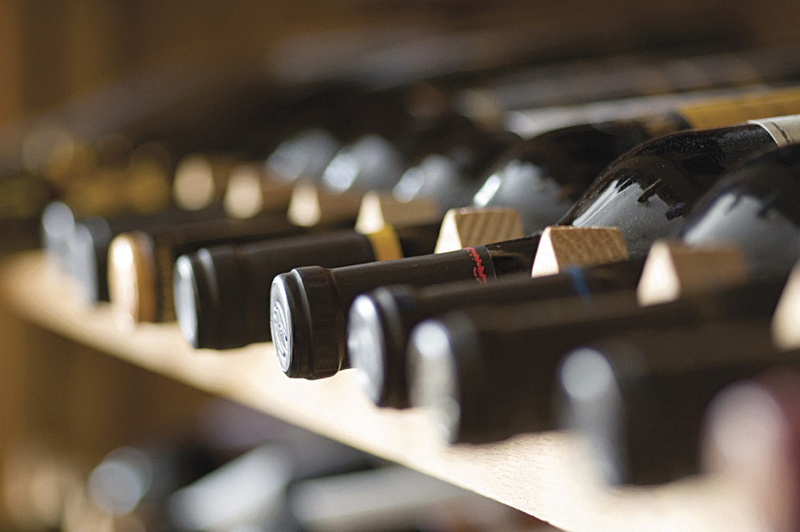 It's important to minimize the movement of wine bottles while you're storing and aging them. Vibrations or too much movement can disrupt the delicate processes taking place over time inside a wine bottle. Fixed storage racks, as opposed to sliding racks, are best equipped to minimize movement when you access bottles in your collection. Also, beware placing your wine near a washing machine or any similar source of vibrations. In some cases, a basement, garage, or closet will provide the conditions described above for storing and aging your wine. If you don't have a space that meets these conditions, refrigerated wine cabinets, which come in many shapes and sizes, can control all the factors necessary for the proper wine storage. Cabinets equipped with cooling units can create the desired temperature range, maintain recommended humidity levels, and provide a clean airflow. UV-resistant tinted glass and fixed racking in solidly-built cabinets can also ensure darkness and minimal vibrations. Storing wine takes some effort and planning. You need to control and account for the 5 variables we've listed to make sure that your wines improve with age. In the end, you'll be rewarded with a collection of rich, mature wines to enjoy, appreciate, and compare. Any questions about how to store your wine? 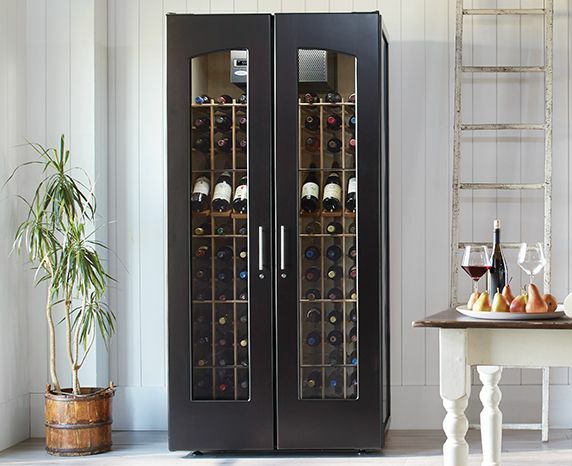 Contact one of our experts for answers and advice about outfitting a wine cellar or choosing a Le Cache cabinet model.